There have been a lot of customer confusion on basic economy fares since Delta Air Lines, United Airlines and American Airlines introduced them in their route network in the last five years. The confusion stems from the different amenities available for these customers by each of these airlines. For example, Delta Air Lines allows them to bring on a full size carryon baggage and use the overhead bin on board while United Airlines and American Airlines do not. 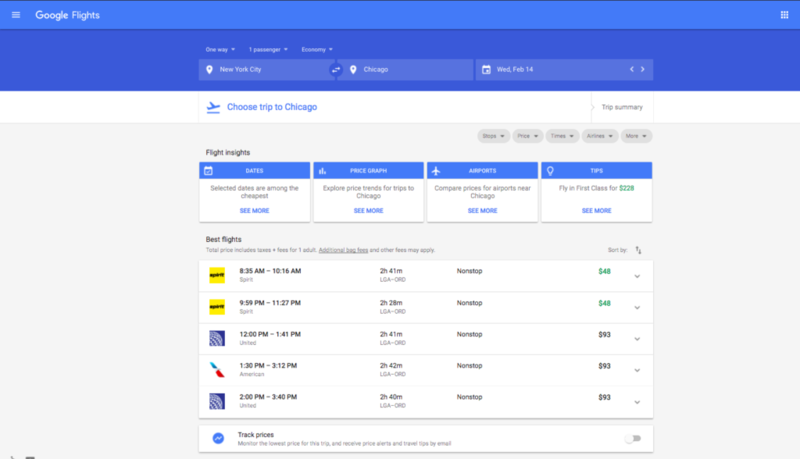 In an attempt to ease confusion, online flight search tool Google Flights has incorporated the amenities included for this fare type in its latest beta release. We look at how this new function works, what is good about it and what Google can do to further improve the customer experience in design and capacities. 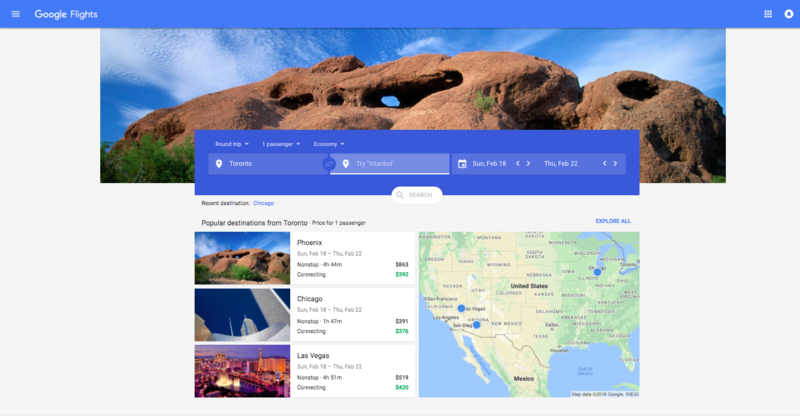 Google Flights is an online tool that allows customers to search for fares based on specific set of criteria including date of travel, origin/destinations, cabin of service, and number of segments. This has not changed in the new beta release. 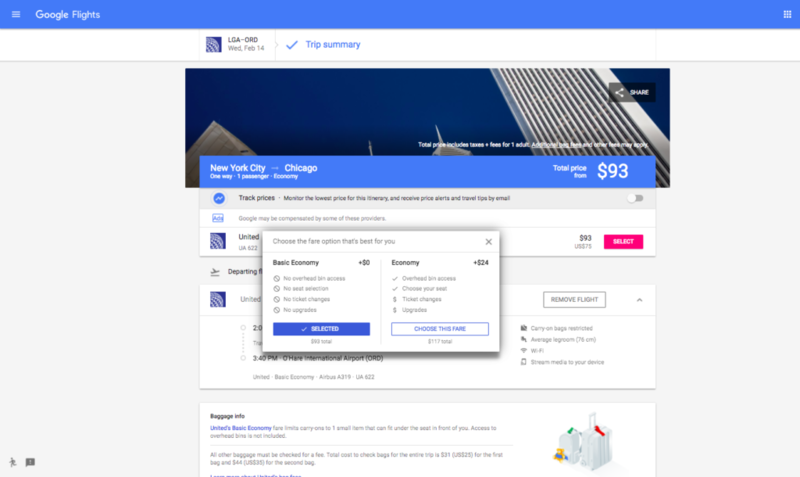 The tool searches for all available fares based on the customer criteria including those from airlines directly or other online travel retailers such as Expedia, Orbitz, and Priceline. Based on the listing (sorted by price by default), customers can select a flight to get more detail information. 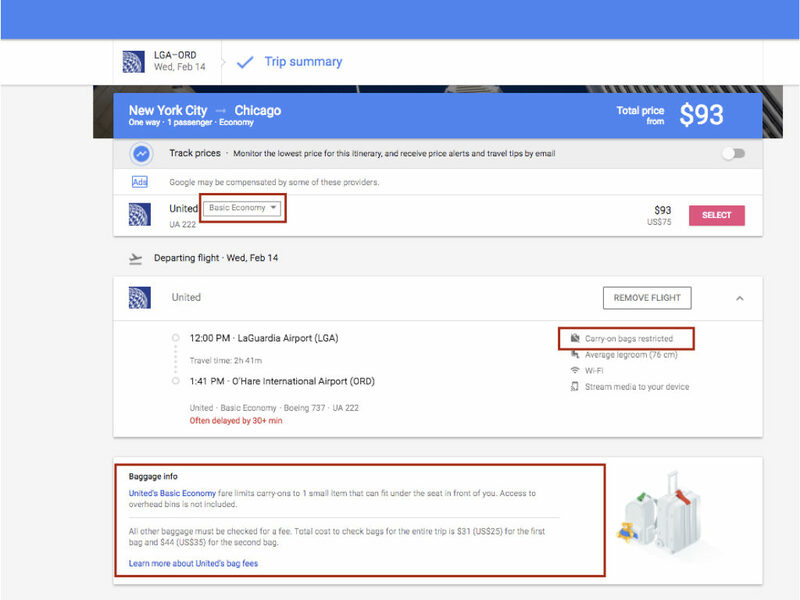 Besides the typical price, flight times, airport locations, seat pitch, wi-fi and entertainment options, Google Flights has added new information (highlighted by red boxes) on whether the fare is the Basic Economy variety and noted any carry-on baggage restriction in addition to baggage information for the fare at the bottom. Clicking the Basic Economy pull down menu would reveal other restrictions for this fare and how much it would cost to get some of these amenities with a higher fare (in this example, it would cost an additional US$24 to obtain use of overhead bin (which implies that customer can bring a full size carryon baggage on board) and to choose a seat in the economy cabin in advance. Once the customer picks the correct fare, pressing the SELECT button will transfer to the airline’s website for booking completion and confirmation (Note that airlines may ask the customer to confirm the lack of amenities available in a basic economy fare before proceeding). What Is Good About This Release? Following other online travel retailers and fare aggregators like Expedia and Kayak, this new beta release provides customers with more information to make an informed decision on what tickets to buy. Giving customers an option to choose another fare with more amenities saves time. Include Basic Economy fares (e.g. with a symbol or a word) to highlight them at the initial search results. To promote fairness, this should include all fares (such as the one shown for Sprit Airlines) which have the similar basic economy type restrictions. In the detail view, Basic Economy should be highlighted with a different color or typeface to draw would be customers’ attention.